From the ceiling of the Byward Market in the City of Ottawa, Ontario, a large colorful mobile is suspended which becomes the topic of conservation for many visitors. 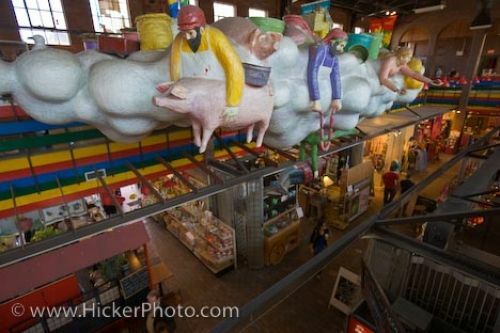 Made by hand, this large mobile consists of farmers, animals and farm supplies where it is suspended from the ceiling at the Byward Market in the city of Ottawa, Ontario in Canada. As people stroll through the Byward Market, this colorful mobile passes on various meanings as to some of the history of the market and becomes the main topic of many conversations. Picture of the mobile suspended from the ceiling at the Byward Market in the City of Ottawa in Ontario, Canada. Being one of the oldest markets in Canada, the Byward Market has grown over the years and is now the number one tourist attraction while visiting the city of Ottawa. About 500 businesses, 260 stands and the beauty of the market, lures in an average of 50,000 visitors to the Byward Market over one summer weekend. Large mobile suspended from the ceiling at the Byward Market, City of Ottawa, Ontario, Canada.